Here is a map demonstrates territory of Belarus, of Poland. topographic map of Sokolka 1 cm to 1 km download for free. actual map of Kuznica calibrated displayed. 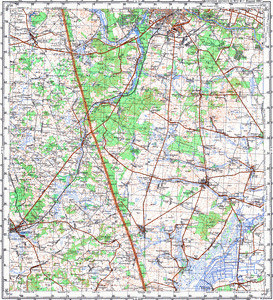 map of Nowy Dwor 1 cm to 1 km download for free. topographic map of Kowale presented. map of Bobrowniki и OziExplorer calibration for you. detailed map of Indura displayed. free map of Zhukevichi и OziExplorer calibration this. detailed map of Zhukevichi calibrated free download. map of Zhornovka 1 cm to 1 km displayed. free map of Zernovka и OziExplorer calibration for you. map of Malaya Zhernovka 1 cm to 1 km for you. free map of Yaskevichi with gps calibration for Garmin. map of Vishnyuvka with gps calibration for Garmin. detailed map of Staradubavaya и OziExplorer calibration for gps. free map of Solomyanka 1 cm to 1 km free download. interesting map of Radevichi with gps calibration for Garmin. actual map of Prokopovichi with gps calibration for you.